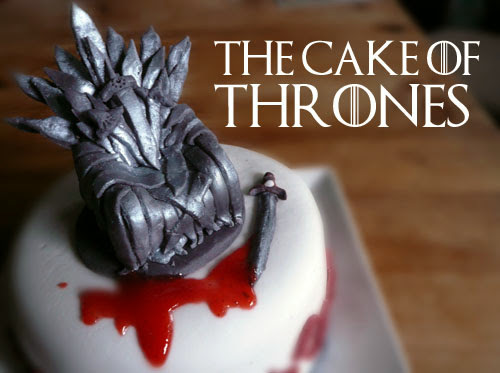 I made the fondant at home (although I've sworn I will never ever try to make it again a million times before) and it wasn't that good, so the iron throne isn't as detailed as I hoped it would be. The fondant was too sticky and too crumbly at the same time and I could barley cut all of the swords out. The cake part is supposed to be a homage to the Starks and Winterfell, the red leaves are supposed to be heart tree leaves (I have a fondant cutter for leaves that I got in a crafster swap ages ago and I never used it before. This seemed like a good opportunity:)). The sword and blood (strawberry jam that is also inside of the cake) were just an afterthought because the cake seemed bare, but I kinda like how they look. ha, this is awesome! He's going to love it! 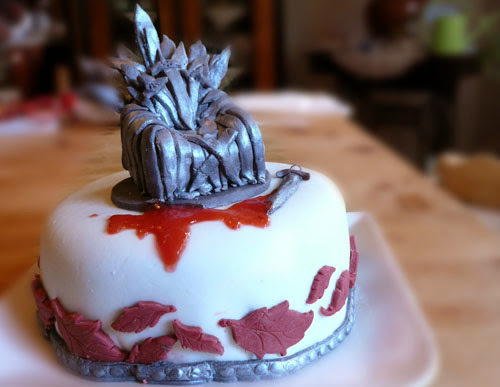 Nice cake, and I love the "blood" =) Did you have any melting problem with the strawberry jam ? The fondant didn't really like liquids during my last attempt. this is fantastic! It looks amazing, I love the blood!